It may have been extremely windy and absolutely bucketing down with rain in Bradford on Sunday evening, but even the ridiculously inclement weather couldn’t deter around six hundred plucky fans turning out for a special four bout dinner show at the Connaught Rooms, headlined by a ten round non-championship International contest between local hero, two division World Champion Tasif Khan, and top class opponent, Ghanaian Ekow Wilson (16-2-0, 14KOs). 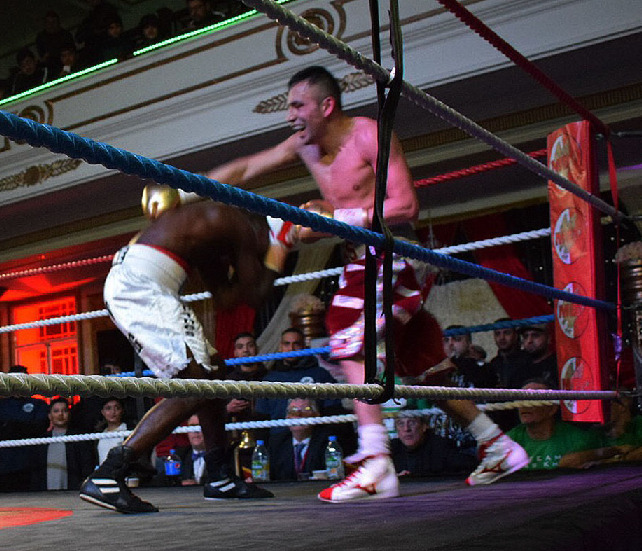 The atmosphere was electric when the MC announced the impending headline bout, each and everyone in attendance were on their feet enthusiastically clapping and cheering as Ekow Wilson made his way to the hallowed ring. However, in comparison the noise level went through the roof when their man Tasif Khan began his ring-walk. The first round was a cracker, both men standing toe-to-toe slugging it out for much it. Round two was fought in a very similar manner for much of the time, however Khan had really started to get into a dominating flow, throwing some sensational body-shots that clearly affected Wilson. Don’t get me wrong, Wilson held his own for long periods and landed some wicked shots of his own. Wilson clearly wanted to protect himself from more body-shots so came in close and once again it reverted to a sensational toe-to-toe slugfest, that was until Khan did a little step back and let rip with another evil body-shot in the final minute, that forced Wilson to once again drop to his knees and catch his breath, again the tough Ghanaian was on his feet well before the count reached six. Wilson’s team clearly switched to Plan B for the fourth round, the canny lad covering up more to protect his body, in an effort to prevent further Khan Exocets finding their target. It was a fantastic round, fought in a far more technical way than the previous ones. It was clear that Wilson had decided to revert back to Plan A and loading up some serious big shots, however that meant that opportunities were there for Khan, and boy oh boy did he take them when they opened up, landing some sensational body-shots once more. As the seconds ticked down towards the final minute Wilson left a gap in his defense, Khan didn’t need a second invitation and immediately let rip with a superb short sharp shot to the body to send the Ghanaian down once more. The crowd went absolutely mental, believing the fight was over, as Wilson struggled to get to his feet, but no, Wilson once again beat the count, just. What’s more on the restart had clearly decided attack was the best form of defense and a seriously entertaining toe-to-toe slugfest ensued until the bell. About half way through the minute break Wilson’s corner summoned referee Matt Scriven, after which the referee turned to the officials’ table and signaled that the fight was over, what followed next was pure pandemonium, Khan, his team, which was headed up by former Two Division World Champion and current WBF Intercontinental Welterweight Champion Lee McAllister, and the fans began celebrating in style. So enthusiastic were the celebration that it would be a good ten minutes or so before the official result could be announced and the winners hand raised, after which the TV crews from both the UK and Pakistan entered the ring along with Khan’s enthusiastic extended team, four of whom proudly carried Khan’s Championship Belts, and surrounded him as the TV commentators tried to interview him. Eventually Khan was able to undertake the interview, in which he said. “Ekow Wilson is a dangerous fighter with a very good record and high percentage knock out ratio; out of his sixteen wins, fourteen came by way of Knockout. Ekow did a lot of talking in the build up to this fight, claiming he has wanted this fight for a ling time, but my team had refused because we were scared, that was utter nonsense. I didn’t respond as I wanted to let my performance in the ring do the talking for me, I respect all my opponents and all who get into the ring to fightand to a certain extent my team and I did respect his power and trained accordingly. This fight wasn’tabout titles and belts this time, it was about pride and setting the record straight, as well as making Ekowshow me the respect I deserve as a fighter, we believe we did just that. I believe at points I could have made it easier for myself and stuck to my boxing skills, but as we both promised fireworksthere was no doubt at some point that's exactly what the fans were going to get. Again I’d like to thank everyone in attendance for making it such an electric atmosphere and a very, very special night, I really appreciate the support and my very enthusiastic fans motivate me to perform at my best. 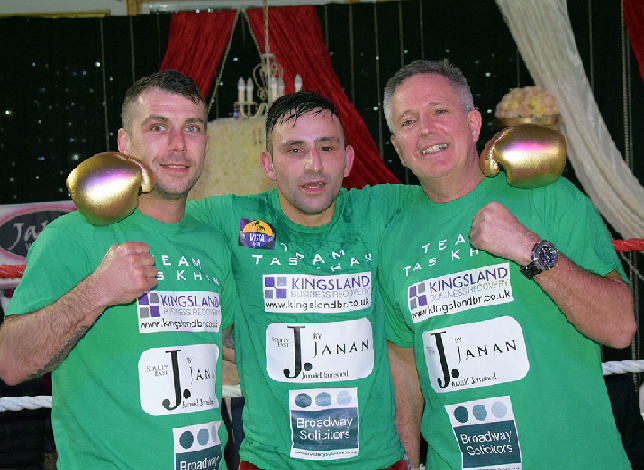 I want to say a massive thank you to my sponsors; Kingsland Business Recovery, Broadway Solicitors, Janan Fashion, SouthPaw Fight Gear and Vista Gym, for their continued support in allowing me to give boxing 100%. Thanks to the venue Connaught Rooms, a wonderful historic venue in my hometown, after tonight I think this could well be our new home for special events. Preceding Khan versus Wilson was another ten rounder, this time between unbeaten in eight and current MBC International Super Middleweight Champion Nathan Decastro and late replacement Latvian Dmitrijs Ovsjannikovs, following original opponent John Akulugu not receiving his visa in time. Pre-Fight Decastro was so fired up, adetermined mindset he later carried into the ring, clearly determined on making a massive statement ahead of his upcoming American debut fight in May. The fight may have only lasted 34 seconds, but in that short time Decastro let rip with a handful of potential knockout shots to the head before letting rip with the literal rib-breaking shot that ended the fight so quickly. Prior to Decasto versus Ovsjannikovs was a rematch between Scotland’s Nathan Beattie and Wales’ Anthony Christopher. The two originally met in Glasgow just a couple of weeks ago on the 4th February. On that occasion Christopher got the nod by a very close 39-38 points decision. Beattie was clearly intent on revenge and started hard and fast, taking the fight to the Welshman. The Scotsman dominated most of the round constantly hunting down his man like a stalking Tiger throughout the three minutes. Having clearly won the first round Beattie stepped it up a little further in the opening moments of the second, appearing intent on gaining a stoppage victory, however it was this approach that proved to be the undoing of the Scot, as in doing so he left himself open and boy oh boy did Christopher take advantage, landing a pin point perfect massive shot to the ribs to end the fight on the two minute and twenty seven second mark of the second round. Opening up the show was due to be Chris Wood versus a returning Lee Noble in a four rounder, however that bout had to be pulled at the last minute, so instead James Higgy and Paul Smith stepped up to the plate for a four round exhibition bout. Normally I wouldn’t cover an exhibition bout, but for this I’m going to make an exception, as this was one seriously top class and highly entertaining contest. Both Men came to fight, this wasn’t a glorified sparring session like most exhibition matches, oh no this was one serious Battle Royale, that see both men going all out for victory from start to finish. I really enjoyed the bout, as did the attending fans, and can only hope that one day these two will face each other again,if they do I will definitely be there for another slice of pugilistic heaven. What a great night of fights, OK there may have only been four of them and three finished early, but in all honesty that didn’t matter one iota, I for one came away very, very satisfied, having really enjoyed each and every fight.